This page contains projects I have been part of during my studies, where I have implemented different AI techniques. 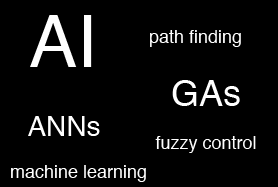 It ranges from artificial neural networks (ANNs) to Genetic Algorithms (GAs). AI related courses I have taken during my studies consist of Machine Learning, Natural Computing, Ai for Games and Puzzles and Advanced Topics in Game Technology, but I have also done a lot of small AI programmings projects during my spare time.